How to spot Magnesium deficiency? 10 Signs to watch out! Surviving each day in this competitive world requires not just our determination and willpower, but our performance depends a great deal on the basic requirements of our body. Our body, as we all know, is a continuous machine running on energy, which comes from a proper balanced diet. Not many people would know this, but a diet does not simply consist of proteins, fats and carbohydrates. Though these are undoubtedly essential and are needed in adequate quantities, the need for vitamins and minerals cannot be ignored. One of the very important minerals by our body is magnesium, which accounts for 300 biochemical reactions in our body and impacts our blood pressure, metabolism, immunity and transportation of calcium along with other functions. Thanks to the environmental conditions of today, our food chain doesn’t contain magnesium anymore. Moreover, our increase intake of caffeine and sugar, along with chemically treated potable water and stress, also leads to magnesium deficiency. Though there are blood or serum tests available of checking your magnesium levels, they are often inaccurate. Therefore, you can look out for the following magnesium deficiency symptoms by yourself and see what can be done to maintain good levels of the mineral. 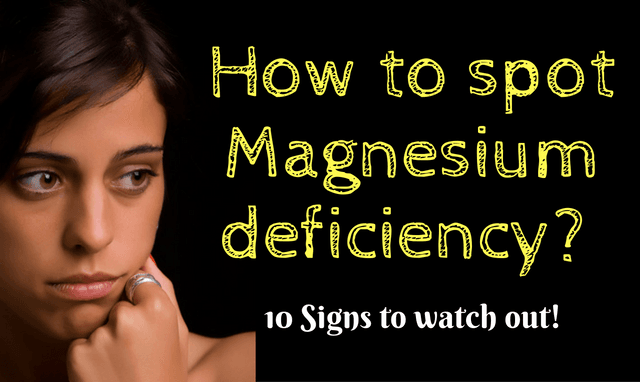 This is one of the most dangerous symptoms of magnesium deficiency, though is unnoticeable from the outside. Though invisible, low magnesium levels lead to coronary heart diseases which can contribute to a deadly heart attack. Even in medical, patients are given injections of magnesium chloride to help in blood clotting and further calcification. Studies have shown that supplements rich in both calcium and magnesium can improve bone support and reduce the risk of bone diseases or osteoporosis. The magnesium will prevent calcification of the arteries, so it’s good to take both minerals in a small amount. Magnesium deficiency can leading to stiff muscles as well, as it is required for muscle relaxation while calcium is required to contract them. This condition can be treated with magnesium supplements as well, as it can help with other muscle disorders such as eye twitching, muscle cramps, fibrosis and facial tics. You can also have signs of hyperactive reflexes, poor muscle coordination, tremors and difficulty in swallowing. Depression can occur for many reasons, and magnesium deficiency is one of them. Stress can also be a cause for this as lack of magnesium will magnify the stress reaction and wreak havoc on adrenaline and cortisol which are linked to fighting anxiety. It is also seen that those with a recent history of surgery, burns and chronic diseases tend to suffer from a severe bout of depression. This can lead to binge-eating cakes, pastries and carbonated drinks which will reduce your magnesium levels even further. Patients of low magnesium levels tend to suffer more from hypertension, and those who were treated with magnesium supplements had a dramatic reduction in their blood pressure levels. Certain foods can also play a big role in both the situations, as caffeine and soda only helps in filtering out magnesium from your situation which leads to both calcium and magnesium deficiencies. For better magnesium absorption, it’s a good idea to keep control over your sodas. Calcium is no doubt the main mineral needed to maintain strong bones, but magnesium is the element which helps in the absorption of vitamin D.
In the absence of proper magnesium supplementation, there can be even reduced levels of the same. Magnesium is also needed to help calcium absorb itself into bones, which lowers the risk of heart attack, osteoporosis, arthritis and kidney stones. Studies have shown that adequate levels of magnesium help in relaxing and maintaining nerve conduction and electrolyte imbalances which in turn contribute to neurological health. Magnesium deficiency does affect the depth of a person’s sleep leading to behavioral issues, anxiety, personality disorders and depression. Magnesium is a very important element needed for creating energy in the cells. To cut a long story short, the lack of magnesium will add to up no energy in your cells thus lead to fatigue, lethargy, lack of drive along with anorexia, nausea and seizures. Those suffering from magnesium deficiency also suffer from poor memory and concentration due to poor nervous concentration levels. Higher estrogen levels in a woman’s body can lead to magnesium deficiency, leading to leg cramps, muscular complaints and PMS symptoms when their female hormones are at a higher level. It is also seen that women who are on birth control or estrogen replacement therapy, or suffer from painful menstrual cramps are more susceptible to such conditions and should take magnesium before the symptoms begin. Magnesium deficiency levels also take a great dip during pregnancy, which leads to the depletion of many other minerals as well. Magnesium supplementation can help you with morning sickness, hypertension and muscle cramps. Visiting your doctor and taking care of one’s magnesium levels during pregnancy will also prevent preterm labor and headaches. Magnesium is needed by other body to absorb vitamin D, vitamin K, potassium and calcium, lack of which we can suffer from a number of disorders such as ADHD, cardiac problems, epilepsy, Parkinson’s disease, Type II diabetes, potassium deficiency and asthma. Studies have also proved that ageing and stress can also play a role in depleting magnesium levels. Treatment for magnesium deficiency symptoms is extremely simple if done at the correct time. Magnesium supplements which are prescribed by the doctor are taken until the levels have risen to the acceptable level. There are products available in the market containing magnesium citrate, which is also a good source of magnesium. One could also apply topical applications of magnesium chloride which could be found in chemist’s shops, which could help in digestion and absorption of vitamins and minerals. However, if you want to increase your magnesium through food sources, these are some of the foods you should try pumpkin seeds, sunflower seeds, sesame seeds, soybean, black beans, ladies’ finger, spinach, figs, bananas, avocado, dark chocolate, yoghurt cashew nuts and almonds. Hence, we now know the importance of all the other minerals in our body each of which have their own functions. To protect yourself from the symptoms, it’s better late than never to start taking supplementing and stocking up our plates with healthy goodness.